As part of our vintage style line, we also offer our most popular styles in a thicker 1.2mm black cowhide leather. We only use the highest quality leather to ensure our motorcycle jackets are comfortable as well as adding that extra bit of protection. These are just thicker versions of our styles and do not include any type of armor or padding. We decided to add this section as a lot of our styles like the Hybrid and Cafe Racer are inspired by motorcycle leather jackets. Our styles have difining vintage character and reflect classic motorcycle styles with our own unique take. Motorcycle leather jackets are the epitome or cool and often as a symbol of rebellion. Worn as early on by riders in 1920's Detroit, the police force and right through to actors like Marlon Brando in The WIld One. From there on in, the image was sealed. So it continues. 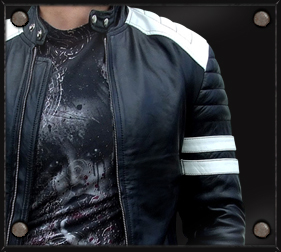 Motorcycle jackets inspired by fashion of the era and fashion leather jackets inspired by motorcycle jackets. Biker jackets in movies and on television continue to push this image of cool through every decade; Easy Rider, Mad Max, The Motorcycle Diaries, Ghost Rider, and many more. (Not to forget Biker Zombies From Detroit). The motorcycle jacket will live forever.